I’d never heard of financiers so checked out the origins. They come from Paris’s financial district. And, they look like wee nuggets of gold. They’re cakes with lots of butter, very little flour and egg whites. The rhubarb makes a tasty addition. Simple as anything to make and nice but not what I would call a really special sweet treat. Beat 6 egg whites, 150g icing sugar, 75g ground almonds, and 50g flour until smooth. Add zest of two lemons. Melt 125 g butter, add seeds from 1 vanilla pod. Cook until light brown and nutty smelling. (There’s a very fine line between light brown and burnt. so watch it). Cool. Fold into egg mixture. Rest for 10 minutes. 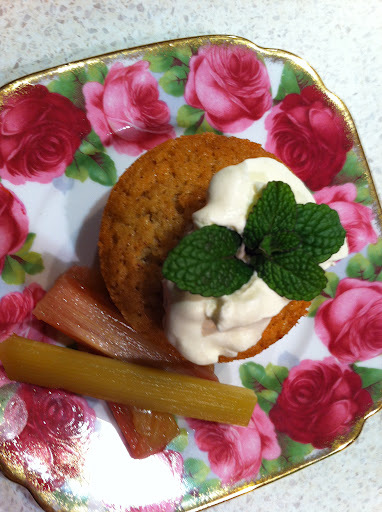 Serve with a dollop of Chantilly Cream (cream, vanilla, and icing sugar) and rhubarb garnish. Photo? Sounds delicious to me. Photo of end product now posted. Shorter and thicker pieces of rhubarb would look better but WOW it tasted great cooked gently in sugar syrup. So much nicer than stewed. It loses its shape quite quickly so you can't walk away from the stove.